Oh, last week was busy! What with my all-adult-things-I-hate day, followed by my birthday, and then helping Rachel get ready for Civil Air Patrol Encampment (she left Saturday), things were a bit crazy around here. So much so that, when I tripped over some suitcases in the living room Thursday evening, I said, "What are THOSE doing there?" and Larry said, "Those are mine." And I said, "Why?" And he said, "Remember? I'm going on a business trip Saturday morning." Oh. Oh, yeah. I forgot about that. So! Larry's gone, Rachel's gone, David's still in Texas, the 2 oldest plus Brian are in Israel, so that leaves...(turns slowly around, counts)...one child in the house with me. ONE. This has never happened before. I mean, not since Theo was a baby and Anna wasn't born yet. Let's see, that was, hmmm, 25 years ago. A quarter of a century, to put it another way. Almost half my life. People, this feels WEIRD. "There's no one here," Susie keeps saying. We eat what we want. We do what we want. No one else's schedule to consider, no one else's food preferences to take into account. I feel as though I'm on vacation. For dinner last night, we walked (exercise!) to a local grocery store and picked up a (darn good) pizza for 10 dollars. It lasted for two nights. ONE PIZZA. 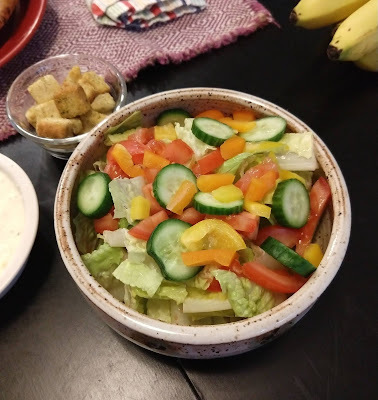 Susie made a cute little salad for the two of us this evening. Is this how normal people live? Normal, meaning people who DON'T decide to have 6 kids? Today I invited my knitting friends over for the afternoon. No one else to consult, and house was already clean because there's no one here. Is this why normal people find it so easy to entertain? Oh, there are drawbacks to being the only ones here. Last night I had to chase down a daddy longlegs spider with the vacuum hose, while Susie shouted encouragement and I tried not to scream; some appliance in the house is giving out a periodic warning beep and neither of us can figure out what it is; and there aren't enough people here for me to use the 2 beautiful cooking pots Larry (somewhat trepidatiously but with Susie's approval) bought me for my birthday. Really, I wanted them. 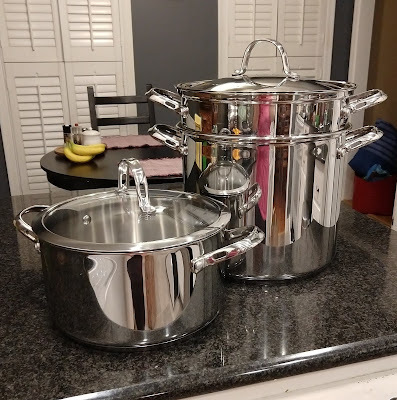 Up to now, any time I cooked something too big for the 6-quart pot, I had to use a huge 16-quart one, which is too tall and too heavy for me to handle safely. So Larry bought me a nice 12-quart number with a colander insert (Hooray! no more risk of scalding myself while draining spaghetti!). He replaced the old 6-qt one, too - the one I bought 14 years ago that has a broken handle that keeps coming loose. So that's 55 years for you - a couple of stainless steel pots makes a good birthday. There was some chocolate, too, of course, and a book or two. But mostly there was enjoyment of a day free of dental appointments, funerals, and board meetings. I met up with a friend I hadn't seen in a while - she treated me to gelato and we took a walk. I tried on clothes at Chico's (motto: Where All The Apple-Shaped Ladies Shop) but didn't buy anything. I let Larry take me out to dinner at Nando's. Best of all, I received a video call from my 3 overseas kids, all sitting on a porch swing thousands of miles away, laughing and talking and making this mom's heart sing. I know! I miss the days I could declare the kitchen "Closed" after dinner clean-up. Now everyone has weird hours and is eating dinner late after work or whatever. I, too, can relate. 6 kids- check. Never having a presentable house-check. I am sitting in the waiting room at my gastroentrologist waiting for my routine endoscopy. A family interested in my babysitting services is coming over late this afternoon. I begged them not to destroy the house this am. AND I justmade sloppy Joes. I usually use the crockpot but didn't start till everyone was already hungry. I tried to fit it all in one pot on the stove. What a mess! Enjoy your new pots and having 1 kid home. Now where do all the pear shaped ladies shop? I need that store. It sounds like a great time there with just one kid! I love your pots too. I have ones that are at least 15 years old. Not in the best shape at this point. I am glad you had a nice birthday, and I love your new shiny pots! Doesn't that make all the difference? We have our three children here and this week our oldest daughter is moving home from her studies in Denmark with her fiancé...that is the first time I typed that!...and they will be living with us! So that will be two adults, five kids, and two dogs all cozy together! Enjoy your quiet time with your girl, who makes a very good looking salad, by the way! Susie's an artist, that's for sure. Enjoy your full house! Enjoy your quiet time! It's only a matter of time before they all arrive home demanding food! There are three adults and one toddler in this house and I can totally relate. This week my daughter and grandson are away and already I can see the efforts of my cleaning and tidying. While I know it won't last I'm happy for the brief reprieve. Sounds like you had a marvelous birthday! The shiny pots are very nice. I have a husband, and me, and a somewhat functional 18yo -- and my house is not clean. Oh, it's better than it was with more kids at home, but we each make up our own mess. To be honest, the 18yo only makes about 10% of that mess. Happy belated birthday! All my kids officially live under my roof not but they are hardly all there at the same time.